With regulations targeting organics on the rise nationwide, a new online resource backed by the USDA, EPA, and other partners, aims to gather relevant material together in one place to make it easier for businesses and organizations looking for information and help addressing food waste issues. 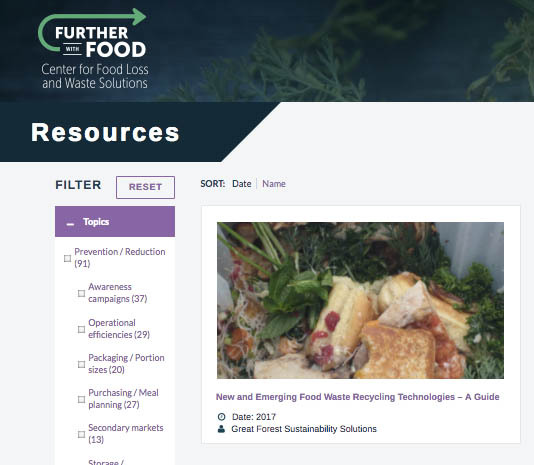 Great Forest’s guide to new and emerging food waste technologies is one of the many key resources available on the new Further With Food online resource hub. Resources are grouped by topic such as Prevention/Reduction, Food Donation/Rescue, Food Recycling /Recovery, Measurement/Assessment, and Public Policy. Food waste is a growing problem, with the U.S. throwing away an estimated 36 to 86 million tons per year. In NYC, inspectors are beginning to issue fines, especially to hotels, for non-compliance of the new organics rule. This is a problem that is not going away soon so education is key. What is the difference between anaerobic and aerobic digestion? What is thermal hydrolysis or pyrolysis? How about food waste to water? The Great Forest Guide To New And Emerging Food Waste Technologies provides an overview and analysis of the various new and emerging food waste technologies available to help businesses make informed decisions about the type of technologies they should be exploring, and what would work best for their needs. This is especially useful for businesses and organizations that generate a large amount of food waste, such as hotels with food service outlets, restaurants, caterers, or buildings with cafeterias. This entry was posted in All, How To Guides and tagged food waste, Further with food. Bookmark the permalink.